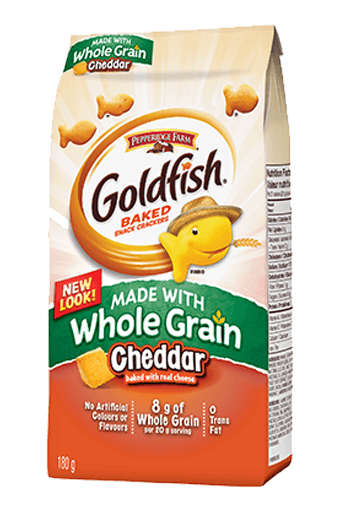 Snack time always calls for a handful of Goldfish® Cheddar crackers. Plus, it’s the perfect pack to have in the pantry. ENRICHED WHEAT FLOUR, CHEDDAR CHEESE [(MILK, CHEESE CULTURE, SALT, ENZYMES), WATER, SALT], VEGETABLE OIL (CANOLA, SOYBEAN AND/OR SUNFLOWER OILS), SALT, YEAST, SUGAR, SPICES (ONION POWDER), SODIUM BICARBONATE, YEAST EXTRACT, ANNATTO, MONOCALCIUM PHOSPHATE AND AMMONIUM BICARBONATE.